The IUCF will be located at 2920 E. 10th St., at the Hinkle-Garton Farmstead that is owned by Bloomington Restorations Incorporated (BRI). 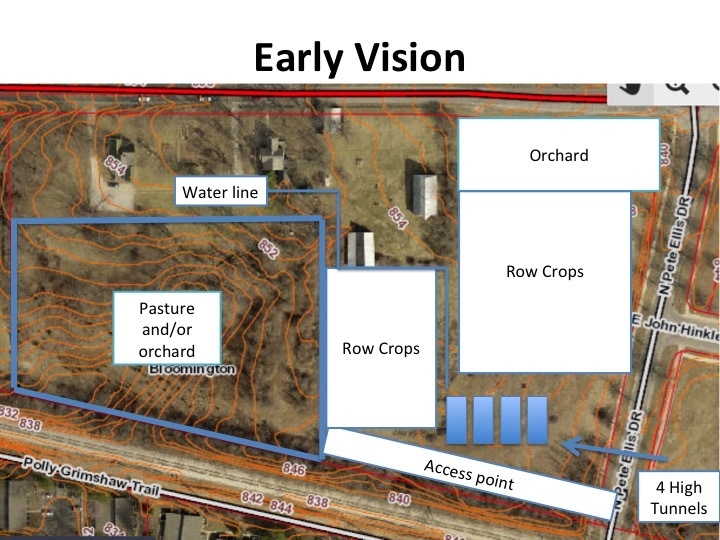 The property is located 0.6 miles from the front door of IU’s Hilltop Garden and Nature Center (a 13-minute walk), and is positioned on the City of Bloomington bus lines for easy access. The property includes 10 agricultural acres, a late 1800’s farmhouse, and four historic barns. Currently, there are ± 5 acres available for crop production, 3 acres available for pasturing, and 2 acres of established fruit and sap trees. We are focused on developing the tillable acreage of the property into productive, fertile vegetable ground, as well as working to establish additional orchards, high tunnels for food research, teaching, and production. The IUCF focuses on specialty crop production (fruits and vegetables). Product from the farm is distributed through three primary channels: through IU Dining Services, direct to consumers via a farm stand on Monday evenings, and food is donated to Mother Hubbard's Cupboard. The IUCF will pursue and gain National Organic Program certification.